If you live in the Seattle area, and are free tonight, I would highly recommend heading to Card Kingdom to play some Commander. I helped start a Commander Night that had a successful launch two weeks ago with 18 people (not bad for a first time event). Now, this is something that Card Kingdom is doing every other week, so if you don’t make it this week, come out in two weeks on the 19th. I won’t be there this time because something about my wedding anniversary being tonight and Wife is putting her foot down not wanting me to go play cards. Anyway, the situation that we’ve got set up is very simple. We’re looking for casual decks and players who just want to have fun and come out. You’re gong to be put into Pods of 4 and play. At the moment, we don’t have a league going (only our second time around), and there’s no points system to keep track of yet. If people are interested in doing something like that, we can talk about doing it in the future. If you have Planechase or Archenemy and want to see if your pod’s interested bring those along too. We all had a ton of fun last time and I got to meet some nice new people. It’s unsanctioned so you don’t need a DCI number to play and, hopefully, won’t find a bunch of Spikes trying to kill everyone early to try and get prizes. Speaking of prizes, there will be some given out randomly so there’s no need for your Hive Mind/Pact turn 4 combo deck. There were plenty of people wanting to play more games after the first round, it looked like the games went about 90-120 minutes, and plenty of trading opportunities. 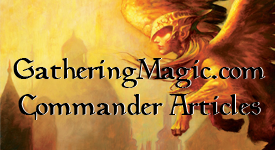 This is a great place to try out the new Commander Deck you just bought or test out your re-worked deck against unsuspecting people. They follow the Official Commander banned list (Found here). The entry fee is $5, and that’s only to help pay for the staff overseeing it and for prizes. They’re going to start around 6:30, and you can give them a call to reserve a spot (206-523-9605). Get there early, or stay late to grab a bite to eat and a drink (if you legally can) at Cafe Mox. If you do go, let me know either here or on Twitter (@MTGColorPie) how everything went. This entry was posted on Tuesday, July 5th, 2011 at 12:59 pm	and posted in Card Kingdom, Commander, Commander Night, EDH. You can follow any responses to this entry through the RSS 2.0 feed. Being one of the fast-growing and more popular formats in Magic: the Gathering has some benefits, including its own blog (Which is what you're reading now). If you're new to the format or you're an old hat, take off your shoes, prop up your feet and stay awhile. You won't be disappointed.